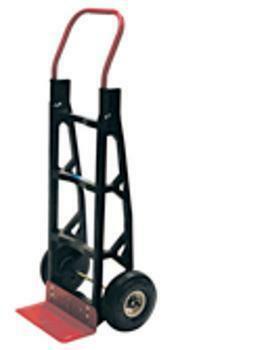 Gleason Consumer Products Company of Lincoln, Ill., is recalling about 120,000 hand trucks. The plastic rims of the wheels can break when overinflated, posing a laceration or injury hazard. This recall involves Milwaukee-branded hand trucks with model numbers 40615 and 60610. The recalled nylon hand trucks have a one-piece, nylon-molded frame and measure 50 inches tall and 21 inches wide. Model 40615 has a black nylon body, a black foot rest and yellow handles. Model 60610 has a black nylon body, a red foot rest and red handles. The model number is located on the crossbar between the handles of the hand truck. The hand trucks, manufactured in the U.S., were sold at Home Depot and Lowe’s nationwide and online at homedepot.com and lowes.com from August 2007, through April 2010, for about $65. Consumers may contact Gleason at 800-520-6335 from 9 a.m. – 5 p.m. (CT) Monday through Friday, by email at nruhrer@gleasonmillw.com or online at www.milwaukeehandtrucks.com and click on Safety Notice for more information.